and keeping you vintage craft on the water and operating it's best! Often, stator coils test and proof good, but there may be some corrosion present, with a resulting poor ground, and hardened tired wiring with corroded bullet connectors. 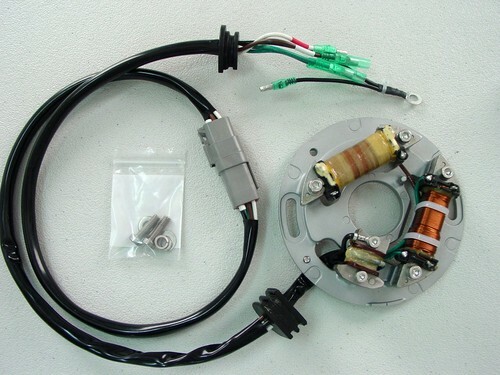 Jetski Solutions can dis-assemble you stator, clean, test, process, revarnish the coils, bead blast frame, and assemble with all new wiring harness. New mounting screws and washers included. The stator is mounted on our custom machine and operated with a CDI and ignition coil just as if it was on a engine. We test to aprox 8K rpm.